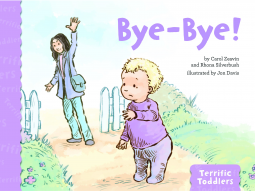 Another in the Terrific Toddler series: Bye-Bye by Zeavin and Silverbush – Joyce's mystery and fiction book reviews with some non-fiction too! My last (for now, because I have no more) review in an excellent series for toddlers and their caregivers. This time, the toddlers don’t want their mom or dad to leave. In a sweet and repetitive way, this picture book reinforces that parents “always come back,” The adults in this simple read aloud acknowledge their child’s feelings and respond supportively. As is true for the other books in this series, the section for adults at theend of the book is excellent. Highly recommended for all who say byes to their young children.